If you haven't already got one, create a Windows Forms project (using Visual C#, obviously) called wiseowl. 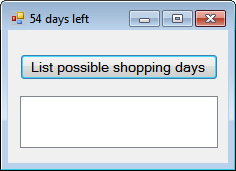 Right-click on your project in Solution Explorer to add an existing item, and choose the file frmShoppingDays.cs in the above folder. 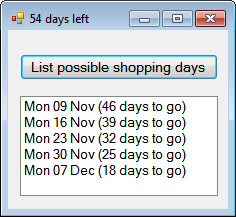 When you click on the button, you should see that there are 54 shopping days till Christmas in the form's caption, as here. you can't bear to shop on the last 2 Mondays before Christmas. CountdownDays - the number of days between this date and Christmas. Your query expression should sort the dates in reverse order, then skip the first two. Don't forget only to count Mondays. What you should see when you click on the button now. There are no doubt easier ways to do this, but none which teaches LINQ so well!